It’s been a long road to the AUT 3 Minute Thesis finals. During the heats, a field of six Masters entrants was whittled to three, and of twenty-six doctoral entrants, just six progressed. Those finalists spent the past couple of weeks rehearsing, and finally, last Friday, it was time to compete. After the PG Symposium, hundreds of postgrad students, supervisors, and friends & family members gathered together. The 3MT finals venue was packed, and the crowd was exuberant. Professor Marion Jones, Dean of Postgraduate Studies, welcomed the audience and explained the rules. Competitors would have 3 minutes each to communicate their research, with just one slide. No props, no costumes, no video or audio support. Anyone going over time would be disqualified. With that, the competition got underway. First: the Masters finalists. Diana Lorenzo spoke eloquently about bringing the voice of the poor into the literature on social entrepreneurship. Next up, Chris Griffiths talked about how AUT has become more diverse since his student days in the class of ’84, and how diversity can contribute to successful work teams. Finally, McDonald William Nyalapa described his research on diabetes in Malawi, and his use of ‘photovoice’ to map the Westernisation of the Malawian diet. Then we moved on to the doctoral finals. Christina Zhang gave a funny and quite personal talk about the phenomenon of ‘leftover women’ in China, and described her research on the perspectives of the women given the label. Riya Biswas talked about her exciting advances in gastrointestinal cancer research, investigating how the ABCC2 gene can be ‘silenced’ to increase the effectiveness of chemotherapy. Next, Geeta Sharma spoke about her research on the use of dance in the classroom, and how teachers can be encouraged to use movement to improve learning in a wide range of subjects. Marian Makkar used the metaphor of the ‘wolf in sheep’s clothing’ to question whether sharing economy initiatives like AirBnB truly qualify as sharing, or whether they muddle traditional hospitality with commercial motives. Rodwell Gundo described his research into a new training programme for critical care nurses in Malawi, which has significantly increased nurses’ competency. Finally, Nitika Kumari spoke about her investigation into the usefulness of transcranial direct current stimulation (TDCS) for aiding the rehabilitation of stroke patients. 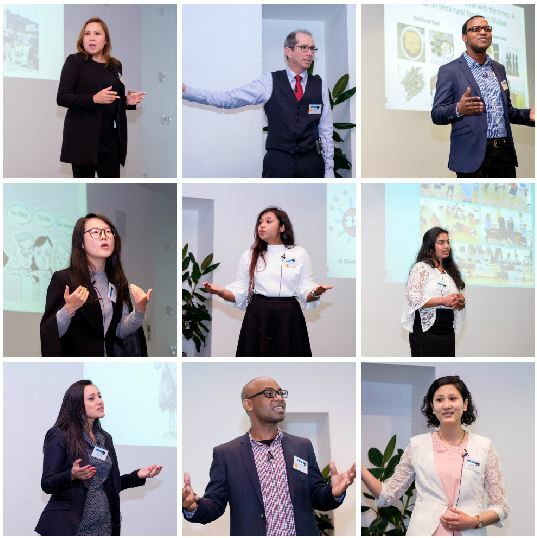 The judges – Associate Professor Jennie Billot, Professor Welby Ings, and 2016 doctoral 3MT winner Iana Gritcan – were tasked with the difficult job of choosing winners. The audience, too, voted for their favourites. 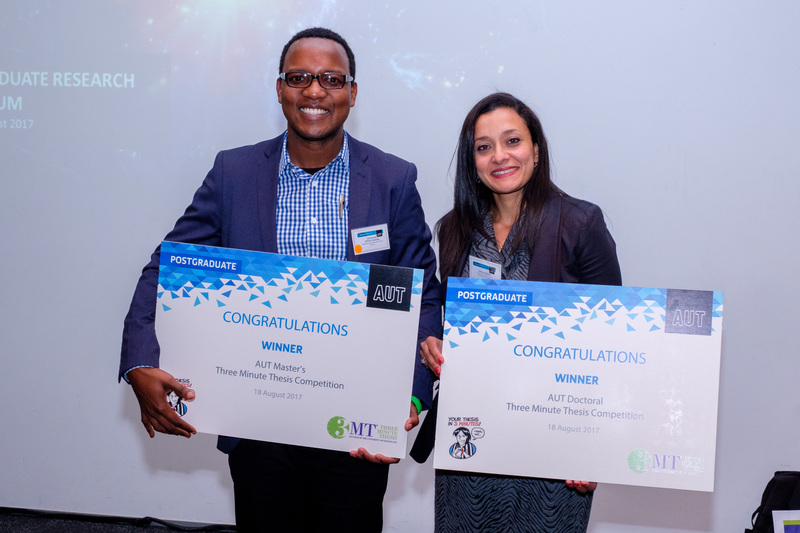 Masters 3MT winner: McDonald William Nyalapa! Masters 3MT audience choice: Also McDonald William Nyalapa! Doctoral 3MT runner-up: Christina Zhang! Doctoral 3MT winner: Marian Makkar! Doctoral 3MT audience choice: Also Marian Makkar! Congratulations to all the winners! A huge round of applause, too, to all the finalists and all the entrants. The standard of entries was exceptionally high this year, and the judges noted how impressed they had been with the competitors’ humour, confidence, enthusiasm, and clearly articulated research. McDonald will represent AUT this Thursday at the NZ Masters Inter-University Challenge at Victoria University in Wellington, and Marian will represent AUT at the Asia-Pacific 3MT Competition at the University of Queensland in Brisbane next month. Both winners will receive personal coaching from public speaking expert Maggie Eyre. Good luck to both winners – we know you will do us proud! Check out the photo album on our Facebook page for more highlights from the event. Tag yourself and your friends, and we look forward to seeing you for 3MT 2018! What an amazing experience which we all enjoyed. We learnt so much about other disciplines’ research, we learnt how to tell our own research stories in 3 minutes and more importantly, we learnt a lot about ourselves. Thank you for the experience and workshops and looking forward to the next phenomenal journey we’re all about to take! Well said Marian. Congratulations again!